They are true Zones heroes! Abigail Gess and Melissa Eaton of Delaware Valley College hold their blue ribbons won during the last two team classes at 2015 Zone 3 Zones. Eaton won team walk-trot-canter while Gess (further to the left in this photo) won team walk-trot which allowed the Aggies to make up a nine point deficit in under an hour's time to advance a full team to Nationals at the eleventh hour. Long Valley, NJ - Let's get the 'expected' part out of the way: The defending National Champion Centenary College Cyclones won Zone 3 Zones in their own facility on April 4th. Though Lafayette College won the first team class thanks to a great open over fences rider from senior Rebekah Scharfe and Penn State then led or was tied with the Cyclones through four team classes it was not too surprising that Centenary eventually won going away with 45 points and a ten point edge on their closest competitor. Meanwhile Penn State University led Lafayette by a 30-22 score through six team classes. Delaware Valley College - the reserve champion the previous two seasons - was in fourth place with 21 points. At that moment DVC had a second, two thirds, two fourths and a fifth with only the walk-trot-canter and walk-trot team classes remaining. But the Aggies did what probably had never been done at a Zones show. Both Melissa Eaton and Abby Gess won those classes in that order to raise the Del Val point total to 35, which pushed them a point ahead of Penn State for second. Both teams broke into tears for different reasons when the results were read aloud in reverse order for the walk-trot class that Gess won. Going into the division there was only one combination of placings to get Del Val to Nationals and it turned out exactly that way. This marked the second time in three seasons that Delaware Valley had rallied to overtake Penn State, having done so in less dramatic fashion at 2013 Zones. 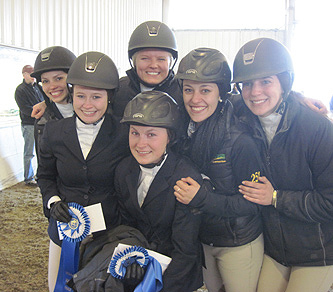 Penn State finished with only one team blue ribbon, awarded to Melissa Stecklow the third team class (novice fences). Centenary won four of five team classes at one point, with freshman Skylar Laakso's first in intermediate fences getting that run started. Cody Wooten (team open flat), Shelby Keefe (team intermediate flat) and Caroline Norton (team novice flat) were the other team winners for the Cyclones, who will field a full team at Nationals for the tenth consecutive season and the 24th time over the past 26 seasons. Individual Open Equitation Over Fences: 1. Hanna Myrdahl, Washington College. 2. Lauren Powers, Penn State University (State College). 3. Lauren Blaha, Rutgers University. 4. Allison Healy, Penn State University (State College). 5. Rachel Salera, Delaware Valley College. 6. Rebekah scharfe, Lafayette College. 7. Tyler Linde, Centenary College. 8. Anna Cardelfe, Villanova University. 9. Anthony DeSimone, Centenary College. 10. Vanessa Lempicky, West Chester University. Team Open Equitation Over Fences: 1. Rebekah Scharfe, Lafayette College. 2. Lauren Powers, Penn State University (State College). 3. Rachel Salera, Delaware Valley College. 4. Cody Wooten, Centenary College. 5. Abby Johnston, University of Delaware. Individual Intermediate Equitation Over Fences: 1. Samantha Frable, Penn State University (State College). 2. Cody Wooten, Centenary College. 3. Alexa Echevarria, Penn State University (State College). 4. Kristin Heslin, Salisbury University. 5. Davide Alexis, University of Delaware. 6. Nicole Galano, Lafayette College. 7. Randi Durkin, Bucks County Community College. 8. Lauren Buettner, Centenary College. 9. Shauna Stanley, West Chester University. Team Intermediate Equitation Over Fences: 1. Skylar Laakso, Centenary College. 2. Kelsey Slowey, Penn State University (State College). 3. Renee Russo, Delaware Valley College. 4. Tara Doele, University of Delaware. Alumni Equitation Over Fences: 1. Katie LaDow, University of Delaware. 2. Caitlin Doran, Rutgers University. 3. Jamie Windle, Delaware Valley College. 4. Maria Simmers, Lebanon Valley College. 5. Amanda Kloetzli, Washington College. 6. Tim Malone, Dartmouth College. 7. Blanton Goll, West Chester University. Individual Novice Equitation Over Fences: 1. Annie Bruno, Stevens Institute of Technology. 2. Morgan Knightes, Centenary College. 3. Grace Harper, Rutgers University. 4. Pam Mukalian, Delaware Valley College. 5. Katie Jordan, Penn State University (State College). 6. Kimber Steiber, Villanova University. 7. Renee Hirt, Dickinson College. 8. Danielle Wolff, Lafayette College. Team Novice Equitation Over Fences: 1. Melissa Stecklow, Penn State University (State College). 2. Caroline Norton, Centenary College. 3. Kayla Birde, Lafayette College. 4. Allie Bienas, Delaware Valley College. 5. Charlotte Cilio, University of Delaware. Cacchione Cup Class: 1. Lauren Powers, Penn State University (State College). 2. Allison Healy, Penn State University (State College). 3. Anthony DeSimone, Centenary College. 4. Abby Johnston, University of Delaware. 5. Rebekah Scharfe, Lafayette College. 6. Gwen Campbell, Rutgers University. 7. Vanessa Lempicky, West Chester University. 8. Hanna Myrdahl, Washington College. 9. Tyler Linde, Centenary College. 10. Rachel Salera, Delaware Valley College (Editor's Note: This class does Not count towards IHSA Nationals. All five high point open riders were each automatically qualified for Nationals as the riders from their respective regions with the most combined open flat and fences points during the regular season. The runner-up riders in the standings in each of the five Zone 3 Regions are also invited to compete in this division). Individual Open Equitation On The Flat: 1. Grace Weidner, Centenary College. 2. Rebekah Scharfe, Lafayette College. 3. Shelby Cashman, Centenary College. 4. Rachel Salera, Delaware Valley College. 5. Morgan Manchester, Bucknell University. 6. Abby Johnston, University of Delaware. 7. Allison Healy, Penn State University (State College). 8. Vanessa Lempicky, West Chester University. 9. Lauren Blaha, Rutgers University. 10. Debbie Kapilow, Drexel University. Team Open Equitation On The Flat: 1. Cody Wooten, Centenary College. 2. Lauren Powers, Penn State University (State College). 3. Rebekah Scharfe, Lafayette College. 4. Rachel Salera, Delaware Valley College. 5. Jen Armistead, University of Delaware. Individual Intermediate Equitation On The Flat: 1. Cody Wooten, Centenary College. 2. Sarah Pavlini, Lafayette College. 3. Danielle Carissimo, Penn State University (State College). 4. Colleen Kenton, Penn State University (State College). 5. Jen Armistead, University of Delaware. 6. Ally Brink, Delaware Valley College. 7. Katherine Boas, Franklin & Marshall College. 8. Nicole Galano, Lafayette College. 9. Molly Koch, Salisbury University. 10. Katie Walker, Drew University. 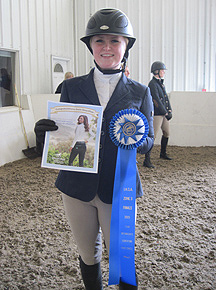 She may not have the actual britches yet, but Skylar Laakso of Centenary College has earned a pair from SmartPak as depicted in the photo she is holding. Laakso won the team intermediate over fences to give Centenary the first of their four team blue ribbons. Team Intermediate Equitation On The Flat: 1. Shelby Keefe, Centenary College. 2. Renee Russo, Delaware Valley College. 3. Casey Norris, Penn State University (State College). 4. Kelly Wallace, University of Delaware. 5. Claire Kojaian, Lafayette College. Alumni Equitation On The Flat: 1. Blanton Goll, West Chester University. 2. Megan Mendenhall, Wilson College. 3. Caitlin Doran, Rutgers University. 4. Jamie Windle, Delaware Valley College. 5. Rachael Lallier, High Point University. 6. Ashton Phillips, Virginia Intermont College. Individual Novice Equitation On The Flat: 1. Erin Craig, Gettysburg College. 2. Alli Bienas, Delaware Valley College. 3. Phillip Williamson, Centenary College. 4. Melissa Fagan, Princeton University. 5. Kristina DeWitt, Centenary College. 6. Katherine Snyder, Delaware Valley College. 7. Alexa Echevarria, Penn State University (State College). 8. Lauren Stevens, Salisbury University. 9. Ginny Wolper, Drexel University. 10. Sarah Westaway, Rutgers University. Team Novice Equitation On The Flat: 1. Caroline Norton, Centenary College. 2. Kayla Birde, Lafayette College. 3. Katie Powers, Penn State University (State College). 4. Holly Dragunas, University of Delaware. 5. Olivia Gardner, Delaware Valley College. Individual Walk-Trot-Canter Equitation: 1. Alexis Haynie, Dickinson College. 2. Jenny Schmidt, University of Delaware. 3. Olivia Burlingham, Delaware Valley College. 4. Matt Drohan, Centenary College. 5. Ann Strzelczyk, Rutgers University. 6. Lydia Lion, Washington College. 7. Jenna Franklin, Delaware Valley College. 8. Jessica Forara, Bloomsburg University. 9. Sarah Paluso, Gettysburg College. 10. Holly Rodeo, United States Military Academy. Team Walk-Trot-Canter Equitation: 1. Melissa Eaton, Delaware Valley College. 2. Alienor d'Arenberg, Lafayette College. 3. Kristi Meibauer, Centenary College. 4. Erica Fisher, University of Delaware. 5. Kristie Stamatis, Penn State University (State College). Individual Walk-Trot Equitation: 1. Marie Koder, Delaware Valley College. 2. Crystal Calderon, United States Military Academy. 3. Erin Mosier, DeSales University. 4. Morgan Minard, Bucknell University. 5. Madison Etchberger, Dickinson College. 6. Renata Pacaja, Rutgers University. 7. Alyssa Kizler, Salisbury University. 8. Kyle Anne Bell, Marist College. 9. Alexander Ross, Valley Forge Military College. Team Walk-Trot Equitation: 1. Abigail Gess, Delaware Valley College. 2. Emily Weaver, Centenary College. 3. Stephanie Orlando, University of Delaware. 4. Monica Meng, Lafayette College. 5. Rachel Streib, Penn State University (State College). Final Hunter Seat Team Totals, with the top two teams advancing to IHSA Nationals: Centenary College (2015 Zone Champion) 45; Delaware Valley College (Reserve) 35; Penn State University (State College) 34; Lafayette College 30 and the University of Delaware 22.